Happy Thanksgiving week! Yes, thats right, week. Let’s celebrate the entire week with gratitude, but instead of just words of gratitude let’s put them into action. Words are nice, but as I have learned they are often just words. It’s easy for someone to tell you they’ll always be there for you but when the time comes are they? Do you say one thing but your actions tell a different story? 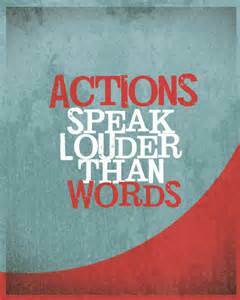 Actions really do speak louder than words, and the same goes for the gratitude we speak. Being thankful is a wonderful character trait, saying words of thanks, making out gratitude lists are all fantastic attributes but for the holiday week let’s amp it up a bit by letting others know how grateful we are by the actions we take. On your gratitude list you may be thankful for your family, but this week take action, for example, you can write a card to a favorite cousin letting him know how much he means to you. You can send your mom some unexpected flowers to brighten her day, or take your niece out to a movie. Instead of just thanking your co-worker or assistant for helping you out with a project, why don’t you make a batch of homemade brownies and bring them to work, or stop by their favorite coffee shop and pick up a gift card. For people who have inspired you in the past, let them know with a handwritten letter just how much they have helped you to become who you are today. Gratitude in action doesn’t have to cost a thing either, a simple sincere gesture like lending a helping hand can do wonders. Happy Wonderful Thanksgiving week, and remember, as you better yourself, you better the world.